Amy Goodman writes beautifully about the grim symbolism of Bloomberg’s destruction of our library. Rachel Maddow covers this most recent attack on the library. NY1 covers our attempts to recover the remnants of our library today after it was destroyed by NYPD and DSNY under Mayor Bloomberg’s orders. NY1 aired footage of the attack on the library tonight, but it’s not yet available on their web site. LA Times covers the thousands of books that the city trashed. The Washington Post covers Salman Rushdie’s comments about the destruction of the library by Mayor Bloomberg, and features the photo of the bible that Bloomberg trashed. NYT cityroom blog covers the experiences of those trying to get their stuff back from the sanitation garage. Slate covers the Mayor’s lies as he tried to cover up the destruction of the library. American Libraries, the magazine of the American Library Association, writes about the rebirth of our library. And finally, AlJazeera covers the People’s Library and the future of OWS. I don’t get why this “movement” is bent on being obtuse. These books are all available at normal public libraries, where, occupiers may note, people work and need to keep their jobs. These “people’s libraries” are nothing more than stale boxes of books on the street – a vaguely veiled sp’ange tentacle – placed to taunt official response and public recoil to said response. In short, this is hate breeding hate which most of us spend a lifetime trying to avoid. There is a better way – you are urged to seek it. im so happy that this is getting a lot of attention!! It’s unbelievable that this continues to happen. That Amy Goodman article hits the nail on the head when she draws an analogy to Huxley’s Brave New World. 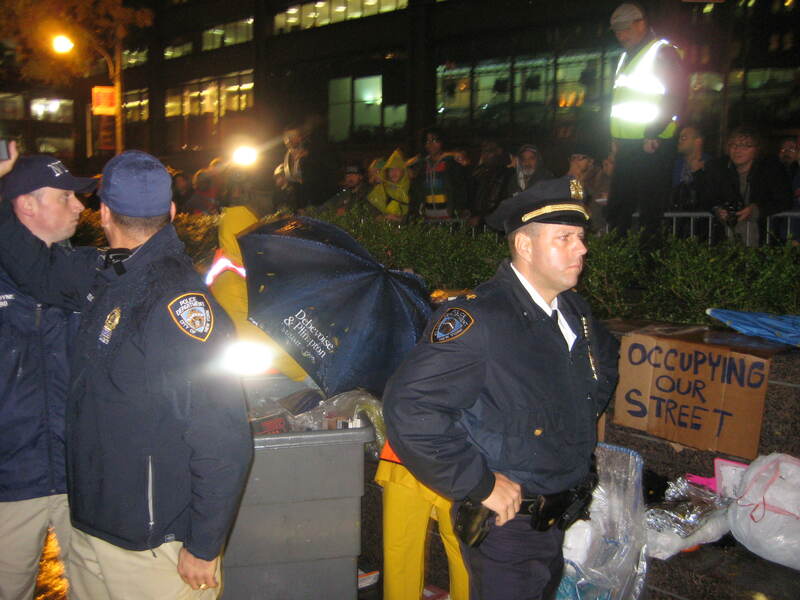 There is something dystopian about all that’s happening, with OWS in general and with the People’s Library. To see our police that we were raised to put our faith and trust in, decked out in full riot gear, crowding people into a corner and pepper spraying them, destroying their libraries, preventing our speech. Whether Huxleyan or Orwellian, its a grim time we’re living in. Keep us posted. this is the correct TRMS clip – the one embedded above is John Hodgman and his non-appreciation/satirical take on #OWS. so glad Rachel covered this is such a timely manner.